8000 Feet and Counting: Celebration! In Colombia, May 15 is the day to celebrate teachers. 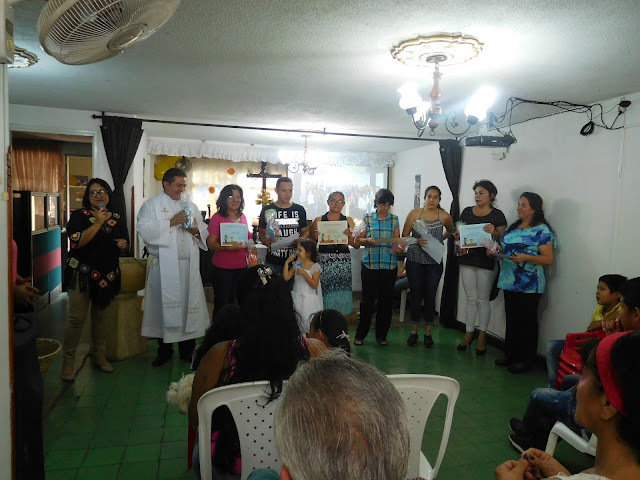 From the Education Ministry of IELCO we want to make sure that the Sunday School teachers and other educators in each congregation are recognized. Taking advantage of a trip we had planned to go to the Eastern Region (Bucaramanga) (with the Foundation which I will write about in a later blog) we asked the coordinator of the region to plan something special for the teachers. Belky did a great job! A photo of the certificates each teacher received along with their goodie bag which had a reusable water bottle, a little puzzle with a cross and dove to color, and some candy. San Juan (Saint John) from Piedecuesta in the eastern region also gifted Zulma and me a doll to thank us for our work with the Ministry of Education and the Sunday School teachers. Zulma is the national coordinator for the two projects: Christian Formation and Formation of Leaders. We are pictured with Maribel, one of the Sunday School teachers from San Juan.